The development of speaking and listening skills is an integral part of a balanced education, for language learners and other students alike. 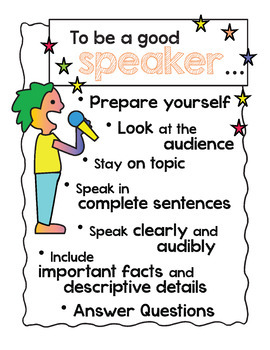 In order for students to learn how to expertly engage in collaborative discussion, become active listeners and effective speakers, strategies in listening and speaking must be explicitly taught, modeled, practiced, and assessed. 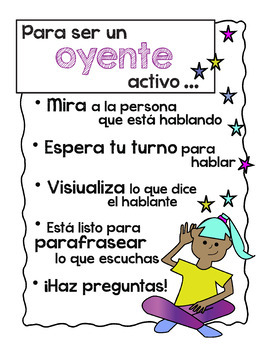 • Cartél de "Para ser un buen oyente..."
• Cartél de "Para ser un buen orador..."
The posters can be printed on 8 1/2 x 11 inch paper, or enlarged. Laminate posters for reuse one year to the next. 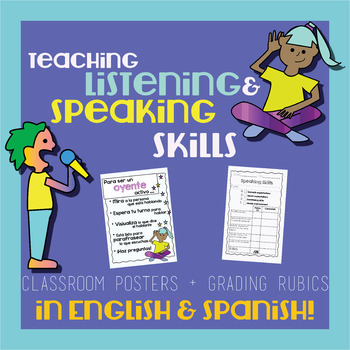 Each rubric can be used to assess listening and speaking skills in a variety of classroom exercises including book reports, morning meeting sharing exercises, listening to guest speakers, etc. 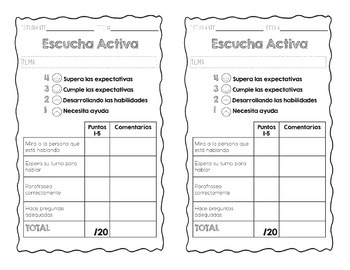 I hope that these can be useful in your classroom. If you purchase, please leave feedback! Thank you!